LAS VEGAS -- Gone are the nights when the name of Manny Pacquiao comes up in chorus from the press every time Mayweather is ask in the post-fight news conference after each successful fight who will be his next opponent is. Mayweather was just fresh from an incredible performance in retaining his WBC and Ring Magazine’s world welterweight championship belt against Roberto Guerrero last Saturday, May 4, 2013 at the MGM Grand Garden Arena’s May Day boxing bonanza in celebration of the Mexico’s Cinco De Mayo festivity, thus compiling a 44-0 perfect record. With almost two-hour post-fight press conference conducted by Golden Boy Promotions CEO, Richard Shaeffer, Pacquiao’s name was significantly absent nor uttered at all with a full-packed and standing-room-only media center. With one fight down in a six-fight $250 million deal with CBS/Showtime, Mayweather is in tune to match Rocky Marciano’s record of 49-0 perfect record upon completion of that deal and be highly regarded as one of the greatest undefeated boxers of all time in the history of the world and be equal to Rocky Marciano. It was bewildering indeed that there was no clamor this time for Mayweather to fight Pacquiao. Not a single media reporter asked Shaeffer, Floyd, Sr. and Mayweather, Jr. the possibility of the mega-fight ever happening within that 6-fight contract Mayweather entered into with CBS/Showtime. It could be out of respect for Mayweather because the night is his to celebrate the way he fought and entertained his fans and deserve nothing else but praise and adulation and a mere mention of Pacquiao’s name is like a taboo that will dampen his mood. Or, maybe, because there is a promoting controversy and insisting on a fight that is difficult to arrange and venture is just an exercise in futility that goes nowhere but down the drain. What could be a worse reason than when memory serves it right when it is still fresh in the minds of the media how Pacquiao dropped face down after a devastating punch from Marquez. There is a twist into it that either Manny Pacquiao is not healthy anymore to mount another come back or his loss to Marquez left a sour and resigned feeling that he is no longer a good match for Mayweather. Of course, it did not help the Obama’s new tax regulations dissuaded Pacquiao from fighting in Las Vegas or anywhere in America. But, that policy is double-edge. Both Pacquiao and his opponent will earn less after tax and if his opponent can accept that tax policy, why not him. Besides, he is helping more people, especially, his countrymen to work during his fight instead of being on-call or on forced-leave. 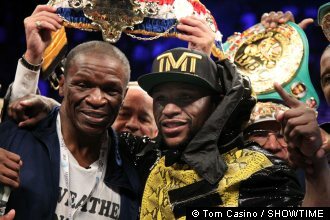 Cinco De Mayo this year is celebrated in Las Vegas with the successful May Day Boxing Extravaganza event with Mayweather’s undefeated record intact and Abner Mares ascension as the WBC featherweight king with his defeat of Daniel Ponce De Leon via a 9th-round TKO. Is it safe to say, though, that Filipinos could celebrate Doce De Hunio (June 12) next year with a comeback from Pacquiao or the media is right all along that Pacquiao’s last fight with Marquez is his last fight. (June 12 is being celebrated by the Filipinos world wide as the Philippine Independence Day from Spain). Rod Mijares also writes for Balita News Network, a Filipino newspaper publication in California and Las Vegas.